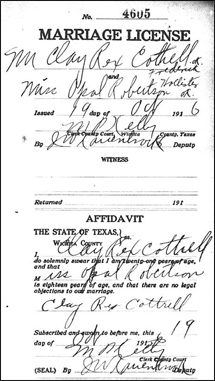 Tomorrow marks the 98th anniversary of the day when a pair of 18-year-olds stood before a Texas judge and exchanged their wedding vows. And a year ago, The Legal Genealogist told the tale of that 1916 marriage — the bride and groom were my mother’s parents Clay and Opal (Robertson) Cottrell — and asked one question. Here’s why that was an issue. And there was no way Clay could have gotten his father’s consent — his parents had separated even before his mother’s death and I don’t think at the time he would even have known where his father was living. So how did these kids get married when they did? So… was the marriage legal? So it was with that marriage: as long as Clay didn’t repudiate it before he turned 21, no-one could ever challenge it. And considering that the marriage lasted a mere 53 years and 11 months — until his death in September 1970 — it’s a safe bet that marriage was legal. I have been helping to digitize marriage affidavits for the Washington State Digital archives, and doing Pend Oreille county affidavits. One of the affidavits had a letter attached from the parents that said they were going to sue the county for letting their underage son marry the bride without the consent of either parent. But they also had a consent form attached. Oh my… threaten to sue and consent at the same time? That’s odd. Actually a couple of days apart, but very close. Ah, that makes more sense, thanks. Given that his mother was dead and his father provided no support, and if Clay had a job and was financially self-sufficient, wouldn’t he have been able to claim emancipation and act as an adult? In most jurisdictions, you couldn’t just claim emancipation: it was something you had to establish legally through court action. In Texas at the time, it was by petition to the county district court — and the person had to be age 19, not 18. Since the marriage was voidable, could someone else have challenged its validity before Clay turned 21? In theory, yes. The question would be, who would the law recognize as having the right to challenge it? The only one I can be sure the law would see as a proper party would be the parent who should have been asked for consent — and he was nowhere around. Thanks so much for the kind words, Joe! What a neat story! Thanks for sharing… you always make these ‘legal issues’ sound interesting!